Another year closes and everyone starts their new year resolutions. Mine are more or less the same as last, to reduce my fabric and yarn stash. To make more memories with the grandchildren and enjoy life. I would also like to be tidier- but don’t tell any one. Last year I managed to donate/sell/gift over half of my yarn stash. I also donated/gifted 50 metres of fabric so that is going well. In 2017 I managed to knit 22 items which equated to 7543 metres of yarn, Thats 7 hats, 6 shawls/scarves, 3 items of clothing and a few cowls. Stephen West has been knitted a lot the latter half of the year with the Disastrous Bandwidth Hat that will teach me to check my tension. the gorgeous Mudmilk hat of which I ended up making 2. In the same Rowan Felted Tweed Chunky I knitted Modish Cowl a really nice quickish easy knit. The other designer I knitted more than one item from this year was Jo Storie. 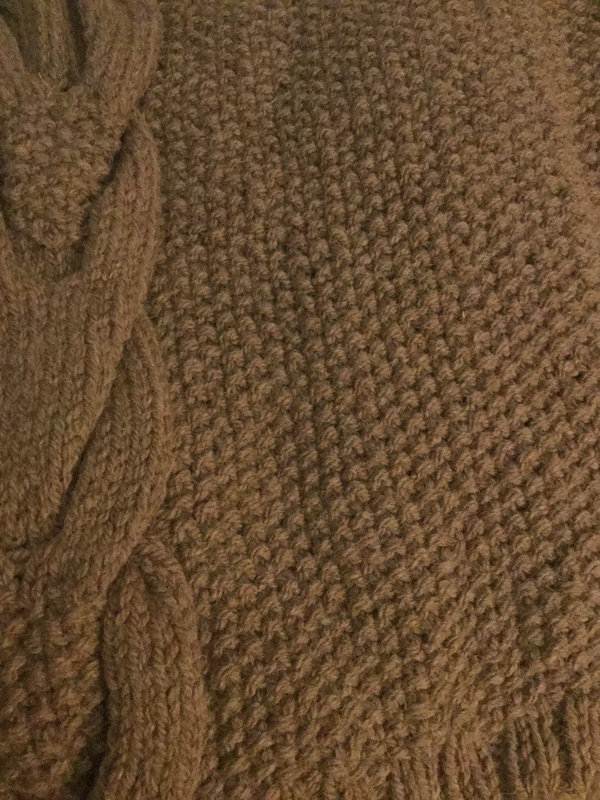 I finally finished my Cove Cardigan which if I was to make again I would make a little shorter. I also knitted a Cove Snood and another Suffolk Hat making this the third one. I need to knit another Cove Snood in the same yarn as my cardigan and I may knit the hat this year too. As usual the year has been one of ups and downs, I prefer to focus on the ups as all in all it’s been a great 2017. I was lucky enough to spend lots of time and days out with Harry and Evalyn and 2018 I plan to do the same again. This week has been very productive. I have decreased my WIPs/UFOs. Now there are only blankets still needed to be finished. All are Debbie Abrahams, 2 are from her books and 3 are Mystery blankets. I finished the gorgeous cove tonight and picked up MB2015 to finish a square and have really got the knitting bug back. As usual life has got in the way of an update, and crafting. Why do I always leave it to the last minute to knit gifts for christmas and winter birthdays? I do it every year, in January I may knit a hat or a set of mittens with the intention of knitting one item every month to prep for the festive season. Of course it doesn’t happen. These last few months I have crammed knitting into every spare minute and have managed to knit 2 scarves, 1 shawl, 1 pair of mittens and 3 hats. I am still in the knit zone so want to continue until I lose my knitting mojo. One of the hats I knitted was Stephen Wests Mudmilk design. I used Rowan Felted Tweed Chunky from stash, this was to be for my appreciative son in law , this was until I tried it on and liked it. This is now mine and I need to knit another one the same for him. I took up the offer at my doctors surgery for an NHS health check. I had the bloods taken and went back fully expecting to find out I had bad blood pressure or diabetes. I was lucky, it turns out my heart rate and blood pressure is good and they have no concerns about my cholesterol. I was shocked and relieved. The only concern was my BMI which I knew. I am too heavy. I am fat. The nurse offered me a 12 week session with Slimming World or Weight Watchers. I chose Slimming World. I don’t do diets and have never been on a diet in my life but I do want to get fitter,and be there for my grandchildren when they get older. I am telling everyone I work with and all those I know so that I am more likely to stick to it. It has been three weeks now and it has been an eyeopener. It turns out for the most part I was eating the right food just not enough and of course there were times when I did eat rubbish . It’s been a mixed start but I made the right choice in choosing Slimming World. Once again this year I am not giving up a single thing for Lent, however I am donating at least one item a day to charity. So far I have donated 2 pieces of furniture , loads of craft magazines and books as well as a few handbags. It feels good to destash and to give to charity. I can wholeheartedly recommend it . My chosen charity I am donating to is Cherry Lodge Hospice . It has been a busy year. I have started two course and signed up for another. I don’t do things by halves do I? I have been keeping up to date with my projects………..well sort of! My aim was and still is to make one item a week, knitted or sewn, big or small, it doesn’t matter. I just need to make something from one of my stashes. 4 skirts for the lovely Evalyn , who chose the fabric and ribbons and helped measure them. Well 2016 has rollercoaster of a year. I am looking forward to 2017 and will be doing the jar filled with sticky notes of good things as well as aiming for more creativity. Sewing has really fallen by the wayside in 2016 and in the coming year I will be sewing a minimum of 4 hours every week. This will be put in my calender as a normal appointment and I plan on treating it as a work date so cannot be cancelled unless I am away. This year I am determined to get the fabric stash down and to make at least an item a week. I will doing more upcycling and making lots for my wonderful granddaughter Evalyn. The blog has been a bit neglected this year so I want to update this more and again have added a calendar reminder to ensure I do it. I would like to wish all of my followers a fabulous, happy, healthy and crafty 2017.